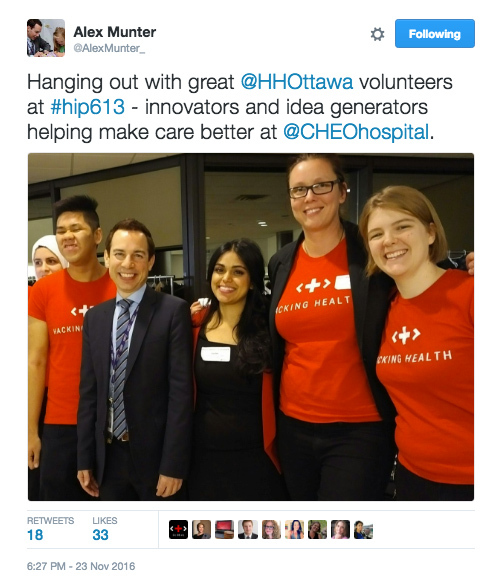 Hacking Health Ottawa has had a busy few weeks! In November, we launched our Health Innovation Program (HIP) in partnership with the Children’s Hospital of Eastern Ontario and the Ottawa Children’s Treatment Centre (CHEO-OCTC). 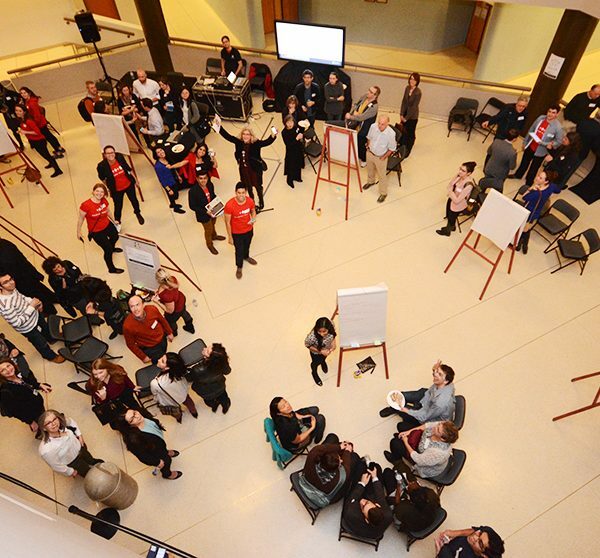 The sold-out event had full tri-sector engagement and brought together clinicians, programmers, designers and local innovators for an exciting evening. With the goal of unveiling the Program, providing insight as to how it would roll out, and having a good ‘ole time, we kicked off the evening with a talk from Haidee Thanda, the founder of the Ottawa chapter of Hacking Health. She described HIP as an “educational journey” that will create an environment in which change and innovation will be adopted. This will be accomplished by creating lasting relationships through a series of talks and hands-on workshops. People with different ideas and skills will have the opportunity to connect, and build teams to tackle problems such as the ones outlined on our Sparkboard. This journey builds up to our capstone event: a hackathon. The hackathon is a design sprint where teams take what they have learned over the Program and work intensively over a weekend to build solutions. This event is not the end of the journey: a prototype is only the beginning. These prototypes will have the potential to transform an aspect of healthcare delivery. And this is where CHEO-OCTC really comes into play; as an anchor partner in HIP, CHEO-OCTC is committed to helping us innovate by considering the successful projects that come out of our Program for pilot opportunities at the hospital. Mr. Alex Munter, CEO of CHEO-OCTC, inspired our community when he said “we have great people doing great things”, and reaffirmed the hospital’s commitment to innovation. He discussed the importance of innovation, and creating a thriving culture that could support growth. CHEO is achieving this by cultivating a community of problem solvers, in partnership with Hacking Health. We then got to hear physicians speak about their experiences with technology. Dr. Matthew Bromwich, a paediatric surgeon and founder of Clearwater Clinical, discussed the importance of physician participation. Having invented and patented products for the medical industry, he is familiar with the dichotomy of business and medicine. He described the pitfalls associated with developing and adopting technology; this is where Hacking Health can fill the gap, by connecting innovators with resources and people who have been through the development process. We also got to hear from Dr. Michael Taccone, a Neurosurgery resident at the University of Ottawa. Having had personal experience with cancer, he knows what it is like to be at the other end; he knows first hand that there are gaps in the patient experience that technology can help fill. Dr. Taccone spoke about the need for a secure technological solution that would enable patients to efficiently communicate with their doctors, and have access to information and support. The event was capped off with “speed ideating,” facilitated by Jen Hunter, Chief Engagement Officer at Great Work. This launch was especially successful because we had nine incredible physicians and nurses pitch their ideas or specific needs, and then interact with techies and innovators. A quick break during the speed ideating session. Ideas ranged from building apps that could help diagnose, treat and monitor patients, to educational tools, and apps that would transform systems, and streamline administrative and triaging procedures — many of these real-world problems were identified during our April event. It was an exciting and promising beginning to the Innovation Program, and we could not have done it without the support of CHEO-OCTC, our dedicated volunteers and our sponsors: Macadamian, Little Victories Coffee and IBM. We could not drive collaborative innovation without their commitment. Sign up for the Hacking Health Ottawa newsletter and to stay up to date on all upcoming event details. This event recap originally appeared on our Medium blog.